This is the latest subject on Facebook `Painting Colorful Birds for Fun'. This is a complicated subject, especially if the bird is displaying, and I decided to adopt a minimalist approach with the head and neck the main focus, the remainder secondary with just an impression. Some others have attempted the full subject but it is too complicated for me. 15" x 11" Not Possibly Artistico 90lb. The colours on the neck and head are mainly Turquoise (Lukas PB16) and various other blues. Sap Green features as does Raw Umber and Ivory Black. Just a touch of Quinacridone Rose (PV19). As a postscript to the Charles Reid workshop at Stow I thought readers might be interested in his recommendations for materials. This is something that always creates great interest although I suggest you read what Stan Miller says about the subject! I have slightly edited these comments - not much mainly about where to buy - and those in bold are mine. 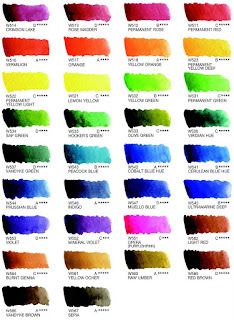 COLOURS: Alazarin Crimson or Carmine, Cadmium Red Light (Holbein), Cadmium Orange (other makes), Cadmium Yellow-Orange* (Holbein), Cadmium Orange (other makes), Cadmium Yellow Light, Cadmium Yellow Pale, Cerulean, Cobalt Blue, Ultramarine Blue, Antwerp Blue (or Peacock Blue** from Holbein), Ultramarine Violet. I use Viridian and Oxide of Chromium Greens, (bring the greens of your choice), Yellow Ochre, Raw Sienna, Raw Umber, Burnt Umber, Burnt Sienna and Ivory Black. 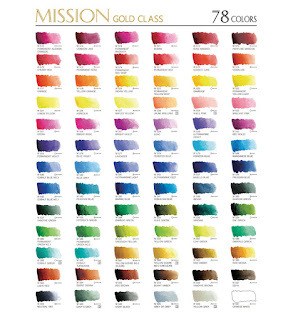 This is my basic palette but these colours are not required. At the Crantock workshop in 2011 Charles had a number of Winsor & Newton pans side by side in the wells of his Craig Young Paintbox, as well as Holbein tube colour in most of the others. I counted 24 in all. This time he seemed to have gone back to Holbein tube colours (see illustrations in the workshop posts) and I counted no more than seventeen. Alazarin Crimson and/or Carmine? These are both PR83 which is considered fugitive (it fades), although only Daniel Smith amongst makers actually calls it fugitive. 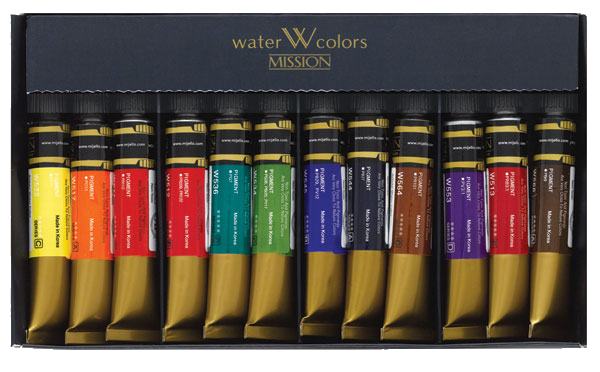 Winsor & Newton do give it, along with one more paint, it's lowest rating but most other makers are ambivalent in the way they rate it. Charles may be using the permanent version of Alazarin Crimson, and certainly mentioned `Alazarin Crimson - Permanent' at Crantock. Holbein Carmine though is PR83. I've never heard Charles talk about pigments, and when the question of the permanence of PR83 Alazarin was raised at a workshop by another student seemed genuinely puzzled, and remarked he'd never had any complaints of fading. If you wish to follow this controversy see my May 2011 posts on both Alazarin Crimson and the Permanent version. * Holbein Yellow-Orange is made from PO20 which is Cadmium Orange. Other Cadmium Oranges vary with the Winsor & Newton version, actually a `hue', a mixture of Cadmium Yellow and Cadmium Red. Daler Rowney add a yellow but several others offer the true PO20. 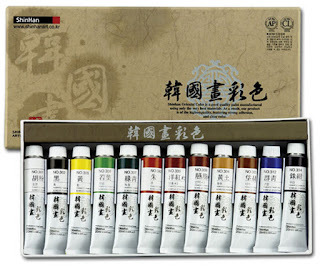 ** Holbein Peacock Blue was originally made with PB17, a pigment discontinued a few years ago. The current version. so a Wetcancas contributor who bought a tube found, is now a convenience mixture made from PG7 (green) and PB15:3 Phalo Blue. BRUSHES: Good brushes are your most important consideration. I wish you could manage at least one round Kolinsky sable brush. 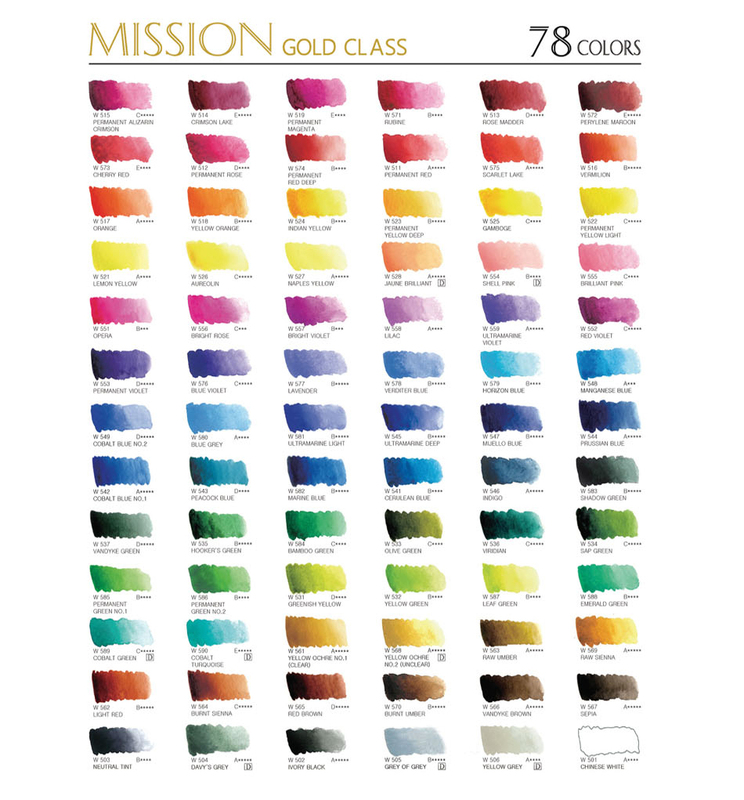 I use Maestro No 77 from Art Express. The Escoda brush is a bit less expensive than the Maestro. If you don't stroke with the tip, your brushes will last for years. 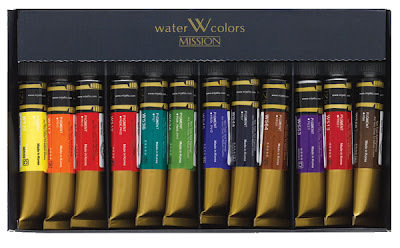 Along with your other brushes I'd suggest a No.8 Maestro OR an Escoda Reserva No.10. They are about the same size. On all workshops I've attended Charles has always recommended Da Vinci Maestro, although I've noticed examples of other brushes in his container. He visited the Escoda factory fairly recently when on a workshop in Spain and they now offer a three brush `Charles Reid' set of 1212 retractables. I have several Escoda 1212 travel brushes and rate them highly, although Rosemary & Co also do a fine range and so do Da Vinci (expensive and only up to a 6) as well as some others. You should note that Da Vinci appear to have different numbers for their brushes in North America and the UK equivalents are Maestro series 10 and 35. The recommended Series 35 are longer, slimmer and more expensive than Series 10. PAPER: I use 140lb (300gsm) Fabriano Artistico Rough and Cold Press but you should bring the paper you're used to. I discourage D'Arches blocks. They are highly `sized' and difficult to use with my direct painting approach. Always try put your paper before the class. Blocks come in various proportions depending on the maker. 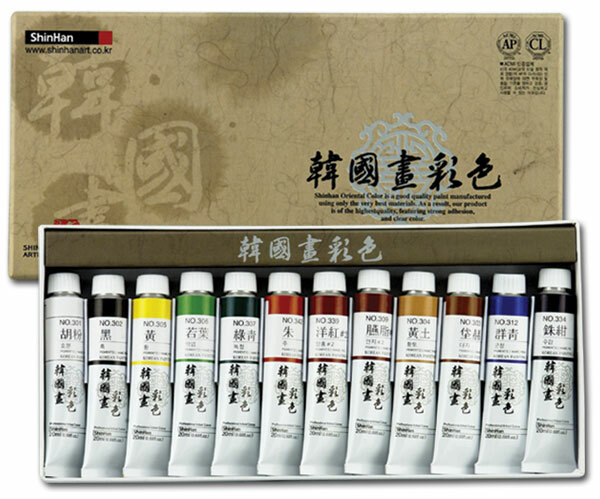 Choose a size that allows you to complete a painting in a single session (about 2 -2.5 hours). Charles also uses Schut and Moldau but Fabriano has been his long term favourite. PALETTE: A Hand held palette is best. Plastic tray palettes are difficult for class painting, inside or on location. I've found students tend to have large amounts of old and dried paint in the overly large wells. It's necessary to have fresh or older paint that's very moist for this class. Holbein has a folding metal palette as well as a small inexpensive plastic palette with the colours I use squeezed out and ready to go. Use a small spray bottle to dampen the colours before class. A Watercolour Sketchbook, for notes and painting along during demos. 9.5" x 13" (closed) is a good size. I don't suggest corrections on students paintings so have your sketchbook handy. On this workshop Charles used his small Sketchers box, which holds 16 colours and also his other Craig Young paintbox as illustrated in earlier posts. STUFF: I use mechanical pencils, 7mm and 9mm HB in class. You will always have a sharp pencil for contour drawing with a mechanical pencil, a kneaded eraser, and a water container. If you're not using a block you'll need clips or tape to secure paper to board (I use a 1/2" thick foamcore panel, cut to the size of the paper I'm using). AN EASEL THAT WORKS: Don't plan on tables or table top easels. Please make sure you understand your easel. It should be light, easy to set up and allow you to paint with your paper and board at a 30 - 45 degree angle. LANDSCAPE SUPPLY LIST: You can't always count on shade.Painting in direct sunlight is hard on the eyes. It's also more difficult in judging colour, value and drying time. I often work on my lap with a small WC block or sketch book. (I need an umbrella for my demonstrations using an easel). Travelling with an umbrella is proving too difficult. I'd just bring a chair or stool you can carry and use your body to shade your painting as you work on your lap. An easel isn't necessary unless you need to work standing. A sketch book can be a good remembrance of your trip, perhaps better than a camera. The sketch book idea is ONLY a thought not a requirement. You'll need a small hand held palette. if you don't have a metal or plastic hand held palette, a plastic palette with colours included is a good choice. I wish you wouldn't bring synthetic brushes. They are cheap but don't hold paint or water and don't "flex" well. Escoda have a fine line of Reserva travel brushes which I highly recommend. I'd choose Nos.6, 8 & 10. If you could manage it a 12 would be good but not necessary. Charles does not like synthetic brushes at all, which he says don't suit with his direct method of painting, but several top artists use synthetics so it is a matter of choice and how you paint. You'll need a water container, spray mist bottle, mechanical pencil with extra leads, Nos 7 and 9 HB or 2B. Very important a kneaded eraser. Think about your set before you come. If you bring an easel - Does it work? You'll need a small container to hold your brushes. I use the top of a thin mailing tube with holes to loop a string around a clip attached wherever handy - always bring extra clips. The final official Spring meeting of Avon Valley Artists took place last Thursday. We will still meet during the Summer but there won't be a programme - just do your own thing, either indoors or outdoors. The subject was `Wrecks and Ruins' - again subject to wide interpretation. Unfortunately I forgot my camera (again) and I wasn't able to photograph the resulting paintings. Sorry about that. It wasn't intentional but the result of me missing several recent meetings and losing my routine. For `wrecks and ruins' I came up with a reference of a crashed B 25 Mitchell bomber, probably in the New Guinea area. New Guinea and the Pacific islands are still awash with wrecks from World War Two and efforts are still being made to reclaim parts of them for museum exhibition or - if still moderately intact - for full restoration. Judging by the state of it - stripped of parts and the original paint having vanished - I'd say it was taken post-war but exactly when I don't know. Several bomb groups of the Fifth Air Force were equipped with Mitchells, and operated from June 1943, initially from Port Moresby, until the end of the war. They were renowned for their very colourful `nose' art, none of which is visible here so I could be mistaken.. I first made an accurate but not super detailed drawing then began to paint. I used my Escoda 1212 travel brushes, sizes 8 and 12, together with a Rosemary retractable rigger and an Isabey Size 6 retractable. Mostly the larger brushes. For the greens I used various mixes of Viridian, Hookers Green, Sap Green plus a couple of mixes with Cobalt Blue and yellow. 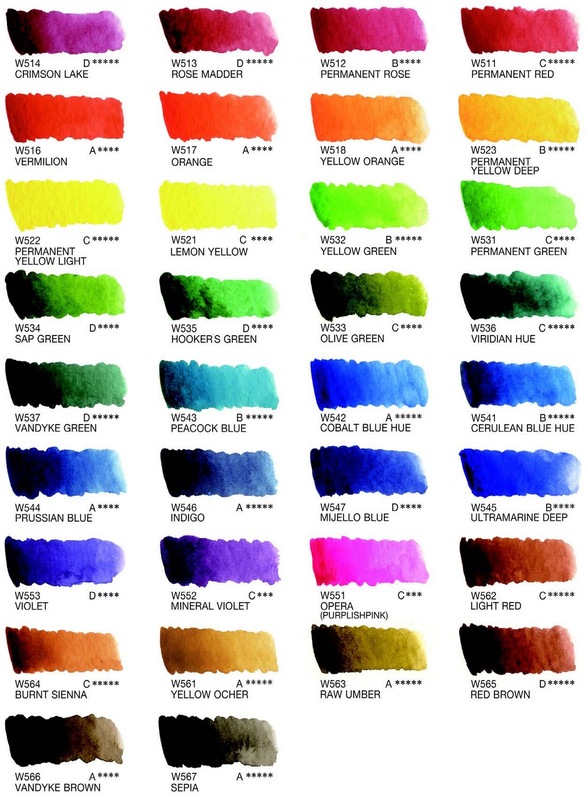 The darks were mixtures of Ultramarine, Burnt Sienna and Burnt Umber plus Quinacridone Rose (PV19) and Viridian (PG17). The other blues are Cerulean and Cyan Blue (PB15:3). To warm things up a little I added Quinacridone Gold (DS PO49) and Quinacridone Rust (Graham PO48). I also used Raw Umber and Raw Sienna. I am quite pleased with the result as I feel I painted it with more freedom. Far too many colours? It doesn't look like that to me so who knows? I'm beginning to think the benefits of my most recent Charles Reid workshop has been to free me up, where I was previously tending to tighten up. I'm not sure what the paper is as it was done on the reverse side of a discarded painting - it could be Centenaire. The total time was just over an hour with breaks. These are my latest bird paintings for `Painting Colorful Birds for Fun' on Facebook. Oranges and yellows predominate with some green and yellow in the background.. Here it is mainly greens and blues. Orange and Turquoise with some Ivory black, with yellows and greens in the background. Also a touch of red. Orange-breasted Sunbird (2) - 15" x 11" Waterford Rough 140lb. This is my favourite so far.The flower is a mixture of Quinacridone Purple (Daniel Smith), Ultramarine Violet (Rowney PV15) and Ultramarine Blue. The bird mainly Translucent Orange (Schminke PO71), Turquoise (Lukas PB16), and Prussian Blue (Graham PB27) with some Indian Yellow (Rowney PY153). There are touches of Sap Green, Ivory Black and Burnt Umber. Raw Umber in background and Sap Green for the flower stem. This is the latest subject `The Southern Ground Hornbill'. What a handsome fellow - maybe to another Hornbill but otherwise..... Mainly blues, purples and oranges with Raw Umber, Burnt Umber and Ivory Black. Also some Acrylic white. Much more detailed than previous but I couldn't see how to handle him in any other way. Another Hornbill (2) -15" x 11" Gerstaeker No.3 200gsm Not. I realise birds are not everyone's favourite subject but in this instance allow me to indulge my penchant for colour. They generally take from 45 mins to an hour including breaks. One good thing is that it helps me keep up the painting momentum. Also on the Facebook page you can compare how other artists tackle the subject and these include professionals, not just amateurs like me. Very instructive. A note on Gerstaeker paper. This is a cheap cellulose paper only from Great Art. www.greatart.co.uk It is very cheap bought in a large pad (65 sheets) and is even cheaper than Bockingford, In this instance of turning out many paintings it is a budget choice rather than the £1.00 plus cost per sheet of cotton-based papers. More of a sketching paper really. You may note however that (in my opinion) the best painting is the Sunbird one on Waterford rough.